For every bad there might be a worse; and when one breaks his leg, let him be thankful it was not his neck. As I rolled down the highway earlier this week, probably going faster than I should have trying to make a meeting, suddenly out of nowhere, my rear tire blew! Anyone who has ever experienced this knows how terribly wrong this could have gone, but THANK God for grace and mercy. With little traffic on the highway, I was able to decelerate and as I was near an exit, able to coast off the highway and conveniently roll into a nearby parking lot. No further incident and minimal damage, and more importantly, both my passenger and I were safe. 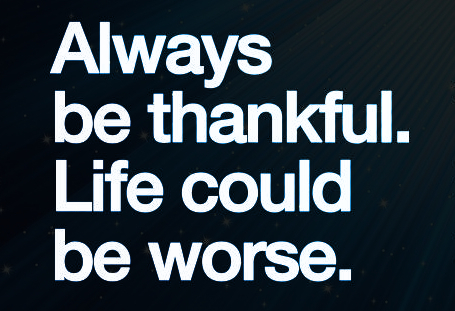 So THANKFUL that is was not worse. As we waited for assistance and began to reflect on what just transpired, both of us almost simultaneously uttered the same phrase, “It could have been so much worse.” Just like life, sometimes our hopes and dreams are blown and shredded suddenly, but if we only take a step back, survey the situation, and reflect on what could have been, we realize what seems so bad, could have been a lot worse. At that speed, on a blown tire, we could have easily been flipping down the highway or loss control and slammed into other drivers, but because no one panicked and acted decisively, no harm occurred. What if when life begins flipping out of control, when others impede our progress or attempt to cause us harm, instead of panicking or acting out, we move decisively to make the best out of a terrible situation. I am not only THANKFUL we came out of the situation unscathed, but very THANKFUL for the tangible lesson learned. Before you began to think woe is me and how unnerving the current conundrum may be, think about how incredibly worse it really could have been. One analogy reads, “If you have food in your fridge, clothes on your back, a roof over your head and a place to sleep you are richer than 75% of the world. If you have money in the bank, your wallet, and some spare change you are among the top 8% of the world’s wealthy. If you woke up this morning with more health than illness you are more blessed than the million people who will not survive this week. If you have never experienced the danger of battle, the agony of imprisonment or torture, or the horrible pangs of starvation you are luckier than 500 million people alive and suffering. If you can read this message you are more fortunate than 3 billion people in the world who cannot read it at all.” If that is not something to be THANKFUL for, I do not know what is. Today, I am THANKFUL that I am still here to tell my story, still have full capabilities of all my faculties, and so THANKFUL that the only damage caused was to a tire. Remember, life may not always seem fair and may deal you a terrible hand, but even when it does, someone else’s hand is a lot worse. Be THANKFUL for the good and equally for the bad because we learn lessons, grow stronger, and find a new appreciation for this thing called life.